Gang violence in high school is a problem that almost all communities face. Many teenagers who do not have a good home life and feel unaccepted or want to have a "family" will turn to gangs. Teens who have friends who are in gangs are also likely to join a gang due to peer pressure. Gang activity and violence is something that can be hard to prevent once teens are in the gang, especially in bigger cities. 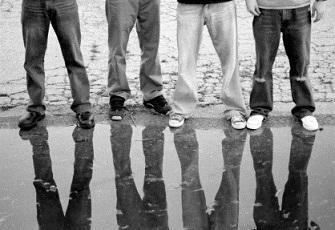 According to the annual National Youth Gang Survey, programs to help kids that are at risk can greatly reduce the amount of teens who get involved with gangs. Causes for acts of violence among individuals are much more complex. Usually, teens from a bad home life or with psychological problems will turn to violence to solve their issues with peers as well as with their families. If you are looking for statistics on gang violence in high school, then the Internet is a good place to start. Using search engines like Google.com and Yahoo.com allows you to find websites with useful information. There are also many books at your local library, but they may be a bit outdated if you are looking for the most recent statistics. According to UrbanMinistry.org, every city with a population that numbered over 250,000 people reported some sort of gang activity in the year 2001, and 59 percent of the homicides in Los Angeles that same year were due to gang violence. The reasons for this amount of violence can be seen in the childhoods of the gang members committing the crimes: At-risk.org reports that 50 percent of men who are abusive toward their spouses will end up being abusive to their children as well. Teens who have grown up in a violent home are often much more violent than teens who have not. While the statistics of teen violence are alarming, there is much that can be done to prevent it. Programs to help at-risk kids, such as the Big Brothers Big Sisters program, can help to prevent violence when the kids get older, as well as help to keep them in school. Parents who refuse to tolerate any type of violence can help prevent it as well, and making sure to keep an eye on teens who seem like their behavior has changed drastically can make possible teen violence or gang activity preventable.